While there is so much to love about San Francisco, traveling the streets can be a difficult and daunting task. The high volume of cars, constant traffic jams, and sprawling urban area makes getting through The Bay Area challenging, especially when the city was ranked as the fifth-worst city in the world and third-worst in the nation when it came to traffic congestion, only being topped by cities like Los Angeles, Moscow, and New York City. And, in crowded cities like San Francisco, public transportation is often the most popular way get from one place to another. In fact, The Bay Area is among the cities with the highest use of public transportation. Although public transportation is one of the most popular methods of travel in the city, a charter mini bus rental offers great benefits and amenities that public transit methods cannot meet. In this blog, we are going to review some reasons why a minibus rental is better than public transportation. The public transit routes of San Francisco are not as intuitive or convenient as you may think. Oftentimes, train, trolly, and bus routes typically go in one direction, meaning you could potentially pass your drop-off point, making nearby destinations take significantly longer to get to. 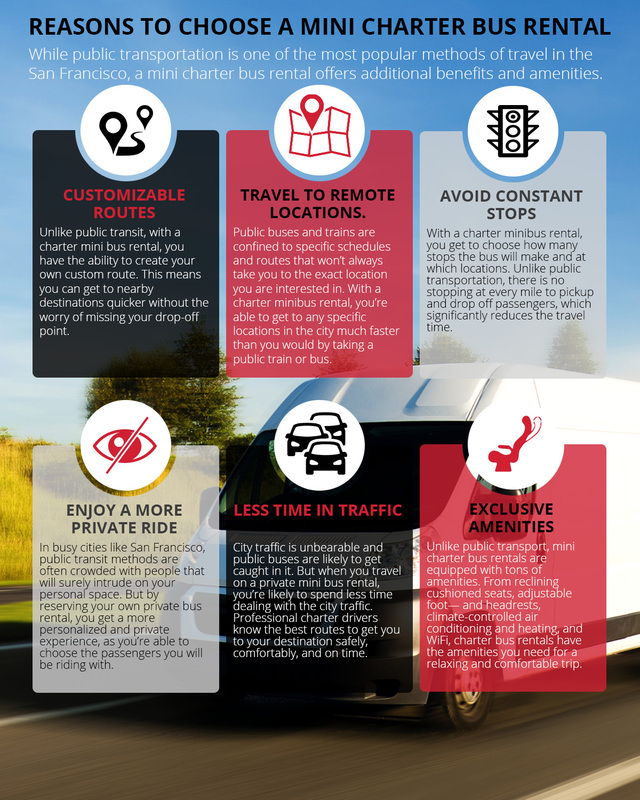 When you choose a mini bus rental, though, you’re able to plan your own custom route. Additionally, the experienced charter bus driver will be able to recommend the best routes for ignoring highly-congested areas. With public transportation, there are only a number of cities and locations that are accessible by train or bus. While public transit fares may be inexpensive, the routes they follow won’t always take you to the exact location you are interested in. Public rail lines and bus routes are confined to specific schedules that may not match yours. However, with a charter minibus rental in San Francisco, you’re able to get to specific locations in the city much faster than you would have taking a public train or bus. Nothing is more frustrating than frequent stopping, especially when you are on a tight schedule. It’s fairly easy to fall behind schedule when public buses or trains are stopping every mile to pick up and drop off passengers. 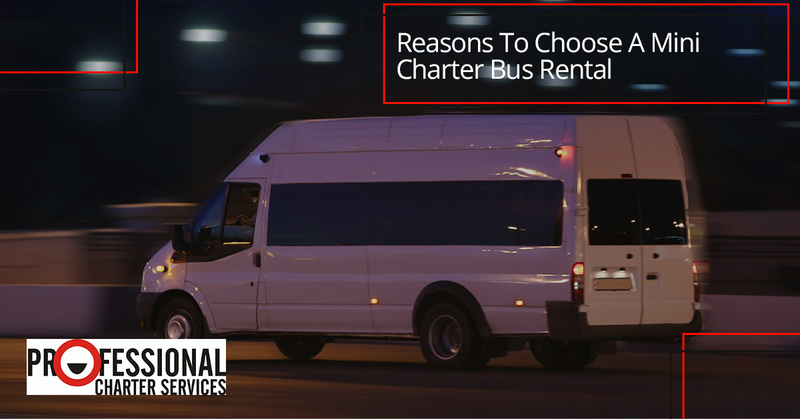 With a charter mini bus rental, though, you not only get to choose how many stops the bus will make, but also their locations too. By choosing customized pickup and drop off locations and passenger pickup points that are exclusive to your group, you can significantly reduce the amount of travel time. In busy cities like San Francisco, public transit methods are often crowded with people that will surely intrude on your personal space. But with rental mini buses, you get a more personalized and private experience, as you’re able to choose the passengers you will be riding with. Avoid the discomfort and uncertainty you may potentially face when riding public transportation by reserving your own private bus rental. Traffic in The Bay Area is unbearable, to the point where many residents would rather choose public transit over their own personal vehicles. However, public transportation, especially public buses, can still get caught in horrific traffic jams. But when you have a group that is heading to the same destination, whether its work, a family event, or to watch a professional sports team play, a private minibus rental is a great alternative to driving yourself or taking public buses. You’ll not only spend less time in traffic. How luxurious would it be if public transportation had on-board bathrooms, cabin climate control, or even free WiFi? While this seems like a dream, it’s exactly what you get when renting a charter bus. In addition to WiFi and climate-controlled air conditioning and heating, charter mini bus rentals often are equipped with comfy reclining seats, adjustable footrests, storage space, and even AC electrical outlets. Reserve Your Mini Bus Rental in San Francisco Today! As you can see, there are multiple benefits of choosing a mini charter bus rental over public transportation. If you are looking for mini buses or other charter bus rentals in San Francisco, contact Professional Charter Services today!